Update: Please note that legislation passed in 2017 amended 37.005 of the Education Code to prohibit out-of-school suspensions for those below grade level three, except for specific serious offenses involving violence, weapons, and drugs/alcohol outlined in Texas law. Additionally, the legislation allows for districts and open-enrollment charter schools to develop and implement a “Positive Behavior Program,” in consultation with campus behavior coordinators, for conduct subject to suspensions under code. More than 20 years ago, Texas AFT launched its campaign to give educators key tools to respond to students who are violent, abusive, or chronically disruptive in the classroom. The Texas Legislature responded in 1995 with the Safe Schools Act, 1 part of the Education Code. This law endows teachers (and bus drivers) with significant authority to help make our schools safe and orderly. Appropriate use of this authority helps ensure that all students, including those who engage in misconduct, receive educational services in a safe and orderly setting that meets their needs. However, the law is not self-enforcing. You must take steps to use it and ensure that administrators follow it. This guide will help you navigate the key provisions of the law and help you determine what part of the statute may be applicable to your situation. To make effective use of the law, be sure to document thoroughly the student misconduct that calls for disciplinary action, and consult your union representative for assistance. Remember: Documentation is the key to successful use of this law. Remember also that you are responsible for safeguarding confidential information about students’ discipline issues, and you put your certificate at risk if you do not maintain confidentiality. How does state law shape local district discipline policy? The law 2 requires your local school district to adopt a student code of conduct that complies with state standards for disciplinary removal of a student from a classroom; transfer of a student to a disciplinary alternative education program; and suspension or expulsion. In case of any conflict between the state law and the local code of conduct, the state law prevails. For example, the local code of conduct cannot reduce the authority granted to teachers by state law to remove disruptive students. 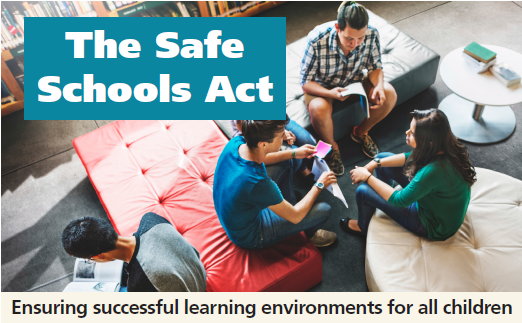 What removal options are included in the Safe Schools Act? The law does more than just affirm your authority to send a student to the office for appropriate discretionary discipline. It gives teachers the power to initiate the formal removal of a student from the classroom, triggering important legal consequences and requirements. The state allows a teacher to remove a student from her classroom for repeatedly or seriously interfering with instruction. The state mandates removal of a student and placement in a disciplinary alternative education program (DAEP) for more serious misconduct like assault causing bodily injury. The state mandates removal, expulsion, and referral to the juvenile justice system for the gravest offenses—including aggravated assault and bringing a gun to school. (5) public lewdness or indecent exposure. expellable misconduct by a student under age ten. (3) felony offenses involving alcoholic beverages or illegal drugs. In addition, expulsion is mandatory regardless of where the misconduct occurred if any of the foregoing types of offenses is committed in retaliation against a school employee. (10) conduct occurring on school property or at a school-related event in another school district that would trigger expulsion if it occurred in the student’s district. How do I initiate discretionary removal from my classroom? (1) Gather all documentation detailing incidents that show repeated interference or behavior so unruly, disruptive, or abusive that you have determined it seriously interferes with teaching and learning (keep a detailed and organized log). (2) Draft a letter to your administration stating you are using your authority under Education Code Section 37.002 to remove a student from your class immediately. It is suggested you use the sample letter for discretionary removal found below. (3) Consult your local union representative to make sure you are meeting all requirements of the law. (4) Deliver to your campus behavior coordinator the written statement that you are using your discretionary removal authority, along with a copy of your documentation. (5) If the campus behavior coordinator does not comply by removing the student immediately, contact your union representative for assistance in securing compliance with the law. What happens when you initiate a student’s formal removal under the discretionary provision? (4) three-day suspension from school. How do I initiate mandatory removal from my classroom? Follow the same steps as for discretionary removal, but use the separate sample letter for initiating a mandatory removal. See below. What happens when a student is removed under the mandatory DAEP placement provision? Each school district must place such students in a DAEP outside the regular classroom and separate from students in the regular program. The alternative program may be on or off of a regular campus. What happens when a student is removed under the mandatory expulsion provision? The student must be placed in a JJAEP or equivalent setting, unless under 10, in which case DAEP is the destination. When can a student return to the removing teacher’s class? Discretionary Removal: The student cannot be returned to the removing teacher’s class without the teacher’s consent-—unless the teacher is overruled by a placement review committee (see next Q&A) that determines such placement is the best or only alternative available. What is the Placement Review Committee? What process must be followed after a student is removed—under either the discretionary or mandatory removal provisions? The principal must schedule a conference no later than the third class day after the day of removal. The student may not be returned to the regular classroom before the conference. The student is entitled to notice of the reasons for removal and an opportunity to respond. In addition to the student, those entitled to attend are: the student’s parent or guardian; the teacher who removed the student; and the campus behavior coordinator. Whether these individuals attend or not, the campus behavior coordinator must then order the student’s placement for a period consistent with the local code of conduct. The law requires every school district to specify the circumstances under which a student may be removed from a school bus. It grants the school bus driver explicit authority to remove a student by sending that student to the principal’s office to maintain effective discipline on the school bus. This authority provides a mechanism to compel administrative attention and action regarding misconduct that jeopardizes student safety on school buses. What notice must school personnel receive when a law enforcement agency arrests or refers a student to juvenile jurisdiction for a felony? (1) The superintendent must be notified of the arrest or juvenile referral before the next school day, or within 24 hours, whichever is less. (5) The superintendent must send the full written information received, including details of violent behavior or weapons used, to all district employees with direct supervisory responsibility over the student. (6) These notice requirements apply to all felonies and to specified misdemeanor offenses: unlawful restraint; indecent exposure; assault; deadly conduct; terroristic threat; gang-related offenses; drug offenses; or weapon offenses. Texas AFT offers trainings on use of the Safe Schools Act and removal authority for teachers and bus drivers. Also available are guidance documents for districts on the steps needed to implement bus driver removal authority. Contact your local union or the state office at 512-448-0130 to schedule a training in your district. 1 Chapter 37, Subchapter A, Section 37.001 et seq. Under the provisions of Texas Education Code Section 37.002(b), I am exercising my authority to remove ______ immediately from my classroom. Please note that under Section 37.009(a)., this student may not be returned to my classroom pending a conference held with you, the student, the student’s parent or guardian, and me. Please notify me as to the date and time of this conference. Please note also that this student may not be returned to my classroom without my consent unless the placement review committee duly established under Section 37.003 of the Texas Education Code determines that such placement is the best or only alternative available. Attached is a cumulative discipline record documenting the repeated interference by______ with my ability to communicate effectively with the students in my class or with the ability of this student’s classmates to learn. Attached is a discipline record documenting behavior by______ that is so unruly, disruptive, or abusive that it seriously interferes with my ability to communicate effectively with the students in my class or with the ability of this student’s classmates to learn. Under the provisions of Texas Education Code Section 37.002(d), I am exercising my authority to remove ______ immediately from my classroom. Under Section 37.009(a), please note that this student may not be returned to my classroom pending a conference held with you, the student, the student’s parent or guardian, and me. Please notify me as to the date and time of this conference. Please note also that this student, if placed in an alternative education program under Section 37.006 for the conduct reported here, may not be returned to my classroom without my uncoerced consent, according to Section 37.009(e) of the Texas Education Code. Please note further that this student, if expelled under Section 37.007 for the conduct reported here and eventually readmitted by the district during or after court disposition, may not be returned to my classroom without my uncoerced consent, notwithstanding any determination by the school’s placement-review committee, according to Section 37.010(f) of the Texas Education Code.